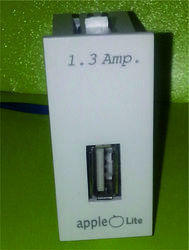 In order to meet excellent quality standards, we are supplying Goldmedal Curve USB Charger 2M Socket. With an intention to enhance the standing we have built, we are occupied in offering a wide collection of Dual USB Universal Socket. We are the manufacturer of 2 Amp. USB Charger Socket. This is 4 USB Universal Socket.